Here at Book Box Club HQ we are hard at work preparing your July Spells and Remedies boxes, in fact, as we speak, brown boxes are being folded up and little scrolls are being rolled and sealed. We are so excited to share our Spells & Remedies boxes with all of our July members because we think that you are going to LOVE the magical featured book and the gorgeous goodies that we’ve selected to go alongside it. Have you heard the news? Our Spells and Remedies box is now SOLD OUT which means we are selling spots for our (as yet secret) August theme! If you like surprises head over to our website now and subscribe. 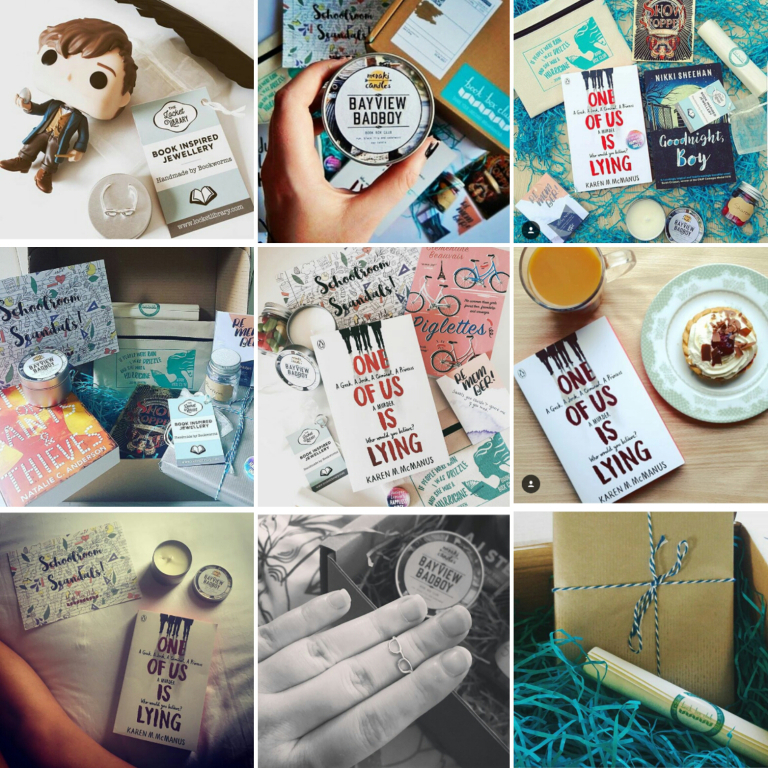 We will be announcing the theme in true Book Box Club fashion, so watch out for the bookish trailer on our social media later in the week! We love seeing all your lovely unboxing photos and videos and this month we we thrilled to see so many of you enjoying your June Schoolroom Scandals boxes. The time has come to show anyone who missed out exactly what we included in the box. We had so much fun putting the June box together because both of us LOVE a school drama and with a little help from our very generous publisher buddies we were able to treat our June subscribers to not just one, but TWO amazing YA books. As always we’d like to say a massive thank you to all of the talented people who helped to make this box a reality and, of course, a huge thanks to our members; you literally put the Club in Book Box Club and make our world go round! 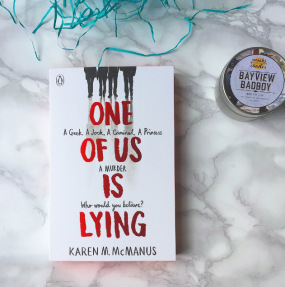 One of us is Lying by Karen McManus– Detention – a pupil suddenly drops dead, but is this is a terrible accident, or is one of the four teen witnesses out for revenge? A twisted thriller that will keep you guessing till the bitter end: was it the jock? The princess? The geek? The bad boy? Or is there more to this schoolroom drama than meets the eye? 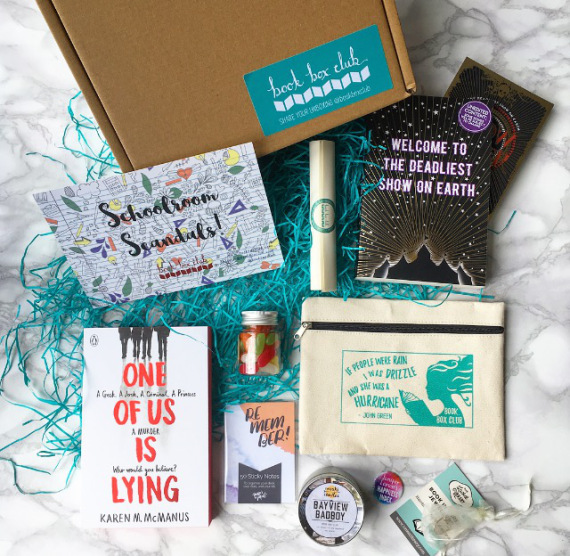 Mystery Bonus Book– Sometimes one book just isn’t enough, so this month we treated our subscribers to a second brand new YA mystery book to top up their summer reading list! Hurricane Pencil Case by Book Box Club– Stash your stationery away in our exclusive Book Box Club pencil case, created exclusively for our June members & adorned with one of our fave bookish quotes from the fabulous Looking for Alaska by John Green. Jelly Beans– Because everybody needs a little playground snack! Bookish Goodies- With thanks to our friends at Scholastic & Penguin Random House. So that’s it folks! What extra bonus book did you receive in your box this month? We’d love to hear what you think about it and we can’t wait to chat to you all about our featured read!. Keep your photos coming on our social media and don’t forget to tag us so we don’t miss anything! 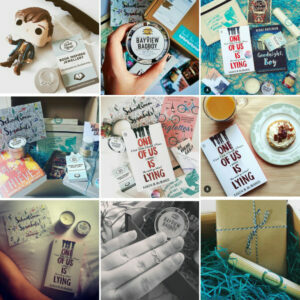 Thanks to our lovely members @bookboxsherlocks, @coffee_stars_books, @ohpandaeyes, @mamalovestoread, @behindgreeneyes, @sarah_w91, @geeky_book_dragon, and @gotherereadthis for these stunning pics!